Where is the downtown in the city of Southfield? There isn’t one is a common response, but if you would have talked with Southfield officials over the past 30 or so years, they would have told you that, some day, it would be smack dab at the corner of Evergreen Road and Civic Center Drive. Over the years, funding and an economy nearly in its death throes made it seem like the dream of a downtown was more like a nightmare. But drive down Evergreen, south of 11 Mile, today and you will find a whole lot more than the ever present potholes and high rise office buildings. Strip shopping centers, a residential loft development, repaved Civic Center Drive – and Lawrence Tech students playing Frisbee on the front lawn of Southfield Civic Center while people stroll by, carrying shopping bags from those strip centers. What is happening along Evergreen is “all telling a great story,” Croad added. And like any story, it has a beginning. The story began with the concept of a virtual downtown, maybe not one carved into small city blocks, but one that was a showcase for the city. It would be walkable and encourage office workers and residents to hang around what is now called the City Centre after 5 p.m., a boon to local merchants. 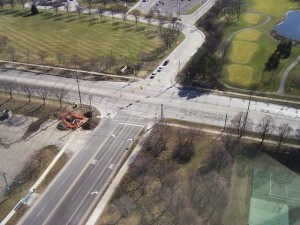 Of course, part of the story meant finding a way to convert the busy, deteriorating and confusing lane changers of Evergreen Road into a walkable venue that would help to link the Southfield Civic Center venue amenities with shops and even Lawrence Tech to the west. “We are in transition from a suburban auto dominated (area) to a more pedestrian friendly mixed use (plan),” Croad said. The plot of this story developed as funding became available and plans for Evergreen advanced. Evergreen was to become a boulevard, but the planning was not without conflict as city council members argued over things such as a rain garden opposed by Councilman Don Fracassi that eventually was scrapped for the boulevard. One thing was clear: Evergreen was to become a showcase for the city. But it also was to be a vehicle – stressed by the council’s youngest member, Jeremy Moss – to bring more young people to the city, members of a generation that favors buses and walking over automobiles. Southfield’s Evergreen story is about to enter a new chapter, with construction set to begin this spring, complete with a boulevard, two roundabouts and streetscaping. The project is set for completion in 2015. From 4-6 p.m. Tuesday, residents will get a close look at the plans and timelines that have evolved over years during a presentation by city staff members in Room 221 of the parks and recreation building located in the civic center, which is located squarely in the “Center of it All,” as the city’s slogan touts, at Evergreen and Civic Center Drive. The $12 million project will be completed with $4.8 million in federal transportation funding for the road reconstruction and $450,000 from a Michigan Transportation Alternatives Program grant for the pedestrian amenities and stormwater mitigation features. Southfield’s Water & Sewer Fund will contribute another $3.5 million and the Major Street Fund will contribute $700,000. The Metro Act Fund will provide $1 million, the City Centre Advisory Board will contribute $100,000 toward the pedestrian amenities, and the Local Improvement Revolving Fund will fund the remaining $1.5 million. Evergreen is expected to remain open, with one through lane maintained in each direction. This section of Evergreen, between I-696 and 10 Mile Road, is being complimented by other work planned for Evergreen between Eight and Nine Mile roads at a cost of $5.1 million. It will include everything from new concrete pavement to new traffic signals. Next week: Residents reaction to the Evergreen Road plans, and how developers are starting to realize the potential for the area.